As a fan of top-town, twin-stick shooters, it often makes me sad to see the genre not get the respect it deserves. The likes of the genre saw a resurgence thanks to the explosion of download services like Xbox Live Arcade, PSN, and of course Steam. Still, sometimes it's hard to find a solid co-op, twin-stick experience. The debut title from developer DreamWorlds is called Splatter - Just Harder Times, and like the genre the game is set in, this is a twin-stick top down AND a zombie game. 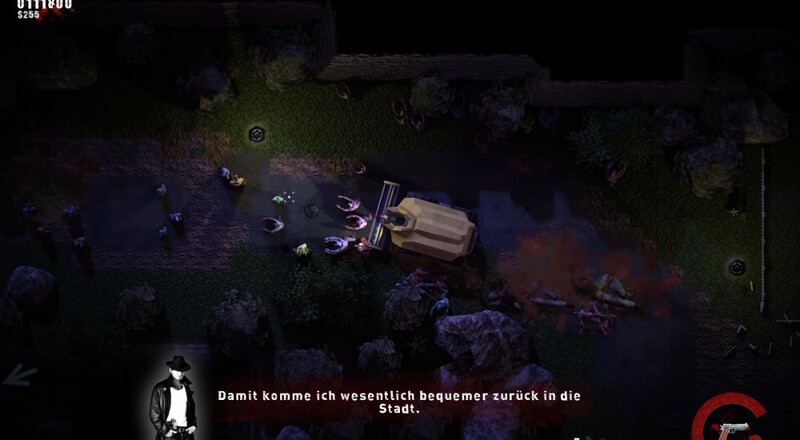 The film noire style game puts players in a zombie apocalypse with dark environments lit up by the flashlight of your character. It definitely gives the game a unique style and developer DreamWorlds promises a fully story with cut scenes to immerse players into the world. The game also lets you drive some farm equipment and run over zombies, this should probably be in the marketing materials. On the co-op side of things, Splatter supports two players locally in survival modes of gameplay that look incredibly bloody. If deathmatch is your thing, you can take on friends in that. Sadly there's no farm equipment co-op vehicle. Splatter - Just Harder Times is out now on PC. The game is still in active development and future updates will be free. It'll set you back $9.99 and can be purchased directly from the developer. Page created in 1.1730 seconds.